The Agricultural Marketing Service administers programs that attempt to facilitate the fair marketing of U.S. agricultural products. The Animal and Plant Health Inspection Service attempts to safeguard America’s resources from exotic invasive pests and diseases and monitor and manage agricultural pests and diseases existing in the United States. It also resolves and manages trade issues related to animal or plant health, and ensures the humane care and treatment of animals. The Grain Inspection, Packers and Stockyards Administration attempts to facilitate the marketing of livestock, poultry, meat, cereals, oilseeds, and related agricultural products, and promote fair and competitive trading practices. 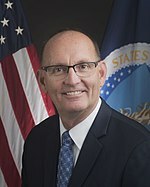 The current Under Secretary is Gregory Ibach, who was confirmed by the U.S. Senate on October 26, 2017. Previous incumbent Bruce I. Knight was confirmed by the U.S. Senate on August 6, 2006. Former Under Secretaries include Bill Hawks, who served from April 2001 until June 2005, Islam “Isa” A. Siddiqui, whose recess appointment was announced by President Bill Clinton on December 29, 2000, and Michael V. Dunn, who served from November 1998 until April 2000. The position was created by the Department of Transportation and Related Agencies Appropriations Act of 1999, which was signed on October 21, 1998 by President Clinton. Prior to this act, there had been an Assistant Secretary of Agriculture for Marketing and Regulatory Programs, which was abolished. The Under Secretary is appointed by the President with the confirmation of the Senate. ^ “Lambert, Dr. Charles (Chuck)”. Retrieved September 21, 2007. ^ “MRP Agencies”. Archived from the original on 2007-10-28. Retrieved September 21, 2007. ^ “Knight, Bruce I.” Archived from the original on September 20, 2008. Retrieved September 21, 2007. ^ “President Bush Announces Eleven People to Serve in His Administration”. Retrieved September 21, 2007. ^ “Agriculture Under Secretary Bill Hawks has resigned from USDA, effective when a replacement is named”. Food and Drink Weekly. June 20, 2005. ^ “President Clinton Names Isi A. Siddiqui As Under Secretary for Marketing and Regulatory Programs at the United States Department of Agriculture”. Retrieved September 21, 2007. ^ “FCA News Release 00-08”. Archived from the original on 2007-09-28. Retrieved September 21, 2007. ^ “Search Results – THOMAS (Library of Congress)”. Retrieved September 21, 2007.